The Kobra +1 SS7 strip cut shredder is a personal and office paper shredder ideal for small offices and homes. 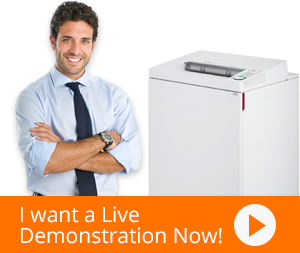 It is a security level 1 paper shredder that takes care of basic security needs. The Kobra +1 SS7 shredder can destroy paper, optical media, credit cards, paper clips, and staples. The 10.2-gallon waste bin collects the shredded pieces and requires no additional waste bags thus reducing operational costs. Moreover, the Kobra +1 SS7 shredder is built with a transparent window for the user to check the waste level. The Kobra +1 SS7 strip cut shredder has a feed opening of 9.2”. The shredder can take up to 26 sheets of paper per cycle and shred them into 1/4” strip cut size. This Kobra personal/office strip cut shredder also features Energy Smart system and switches the paper shredder to a standby mode when not in use. Hence saving energy and reducing on total cost of ownership. Moreover, the Kobra +1 SS7 shredder is incorporated with electronic sensors that automatically start and stop the shredder.